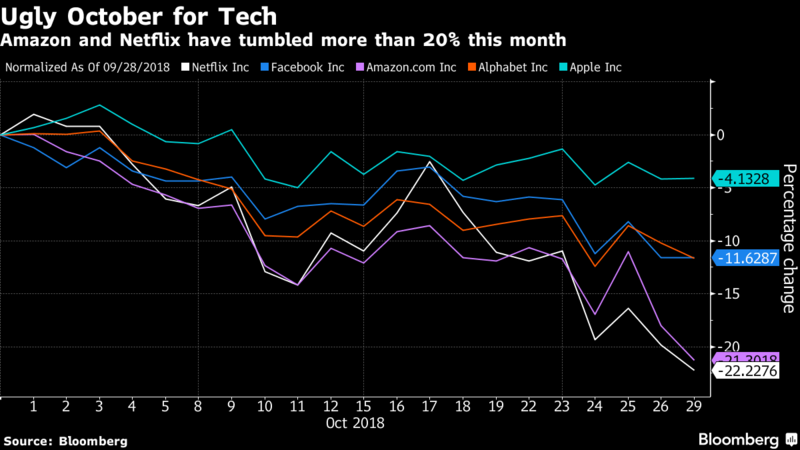 Another week, another sell-off for the world’s biggest tech and internet stocks. Investors hoping for a reprieve from the worst month for technology stocks in a decade were greeted with more selling on Monday as Amazon.com Inc. tumbled as much as 8.3 per cent and Netflix Inc. slid as much as 7.1 per cent. Facebook Inc. was down 3 per cent in mid-day trading ahead of its earnings report on Tuesday. Google parent Alphabet Inc. slid 5.4 per cent. The Nasdaq 100 Index gave up early gains to fall 2.6 per cent at 3:23 p.m. in New York. If the index remains lower, it would be the first time in more than three years it erased an intraday gain of at least 1.8 per cent. The Information Technology group was among the worst performers in the S&P 500 on Monday. The sector has fallen more than 11 per cent this month amid a spike in volatility. That’s on pace for the biggest monthly decline since October 2008. The slide came as the U.S. is said to be preparing to announce tariffs by early December on all remaining Chinese imports if talks next month between presidents Donald Trump and Xi Jinping fail to ease the trade war, according to three people familiar with the matter. The U.K. government also proposed a digital services tax on Monday that targets 400 million pounds a year (US$512 million) from companies like Alphabet and Facebook.